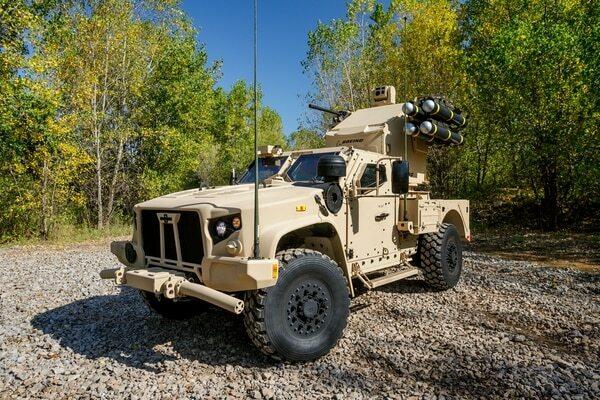 WASHINGTON — The Army is laser focused on making its force more lethal and also more prepared to fight against peer adversaries and emerging threats, so Oshkosh Defense is showing how the Joint Light Tactical Vehicle can be configured to meet the service’s most pressing needs. At the Association of the U.S. Army’s annual convention, Oshkosh is displaying two different versions of the JLTV, the service’s Humvee replacement currently in low rate initial production. The first is an answer to bringing more lethality to the battlefield and the second tackles a current Army Short-Range Air Defense (SHORAD) capability gap that has been identified in theater both in Europe and in the Middle East. One JLTV on display is a four-door, general-purpose variant with a remote weapons station and a 30mm cannon, along with a notional compact laser weapon system, according to Dave Diersen, vice president and general manager of joint programs at Oshkosh. The laser weapon configuration “is designed for many potential uses,” he said, one of them being a solution to go up against unmanned aircraft systems, which could either shoot down or dazzle them. And the 30mm cannon is meant to bring enhanced lethality capability over the .50 caliber gun, Diersen added. The Army, in a wish list sent to Congress in December that outlined what it wanted in the near-term but couldn’t get using current funding levels, asked specifically for a 30mm gun for the JLTV. Oshkosh demonstrated a similar JLTV configuration with a 30mm cannon in January this year at the Bushmaster Users Conference in Arizona. The company successfully fired two JLTVs with 30mm guns — one from Kongsberg and one from EOS. Adding a laser weapon to the configuration shows what is feasible on a smaller vehicle like a JLTV, Diersen said. The Army is working on high-energy laser capabilities and has increased the kilowatt power of its lasers as it proceeds in development, but has also shrunk the size of the vehicle needed to support the laser weapon and successfully tested a high-energy laser on a Stryker combat vehicle. Integrating a laser weapon system into the JLTV is another way of showing the vehicle was designed with growth capacity to be able to house a wide variety of weapon systems that exist today, but also could be developed down the road, according to Diersen. The other JLTV on display at Oshkosh’s booth is a two-door variant with an Avenger system on the back as a possible mobile SHORAD solution. The configuration will show the Avenger air defense system equipped with Longbow Hellfire missiles coupled with a .50 caliber weapon, Diersen said. Avengers only exist in the Army National Guard now and are being rapidly deployed to the European theater to meet the SHORAD capability gap there. But the Army is searching for an interim mobile solution that can be quickly fielded to units in Europe as well. This isn’t the first time an Avenger has been married up to a vehicle currently in the Army’s inventory. Boeing and General Dynamics Land Systems announced this August at the Space and Missile Defense Symposium in Huntsville, Alabama, that they were teaming up to build a SHORAD system by putting an Avenger on a Stryker. The team participated in a demonstration last month at White Sands Missile Range, New Mexico, to prove out the system’s capability. But the two JLTVs at Oshkosh’s booth aren’t the only JLTVs on the showroom floor. Israeli defense company Rafael is displaying its smaller version of its Trophy Active Protection System (APS) on a JLTV — Trophy Lite. Trophy is the recent U.S. Army selection for an interim APS solution for the Abrams tank. Additionally on that JLTV, is the Samson remote weapon station with 30mm M230LF ChainGun. According to Rafael, this is the second time it is presenting an advanced integration with Oshkosh. 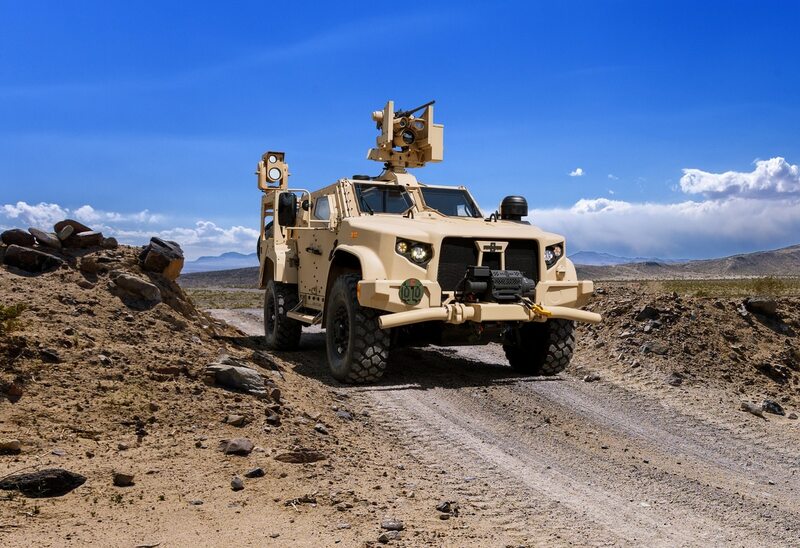 In 2015, Oshkosh’s Mine Resistant Ambush Protected All-Terrain Vehicle was configured with the Trophy-LV APS and a remote common weapon station with a .50 caliber machine gun and a Spike anti-tank guided missile launcher.